Members gathered on Friday in support of their Captains. Ted Eccleshall and Lady Captain, Sue Boyes for the presentation of their donations totalling £7,170 to their chosen charities Prostate Cancer UK and Motor Neurone Disease Association. 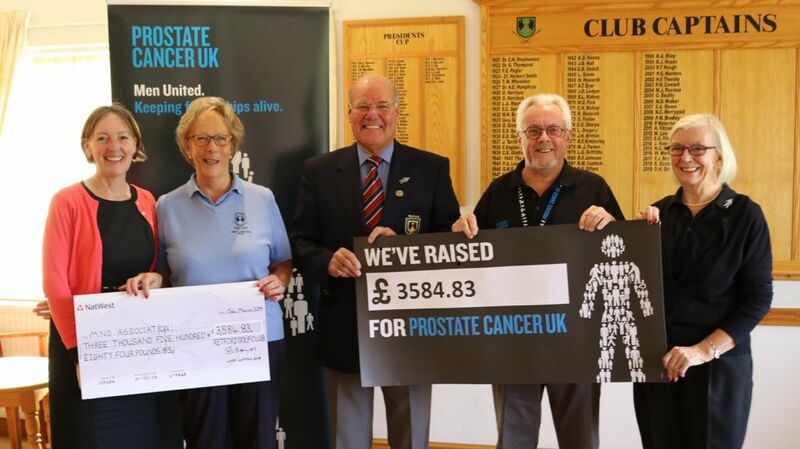 Representatives from the charities were fulsome in their praise of the efforts made by the captains and the members and for such outstanding generosity whilst Ted and Sue thanked their helpers and other members for their unsparing work and time. Thanks are also due to local businesses who donated vouchers and especially to the generosity of local people who gave great support to our 2 day collection at Morrison’s Retford store. Early diagnosis of prostate cancer can have a good outcome but motor neurone disease has yet to be cured or diagnosed early. 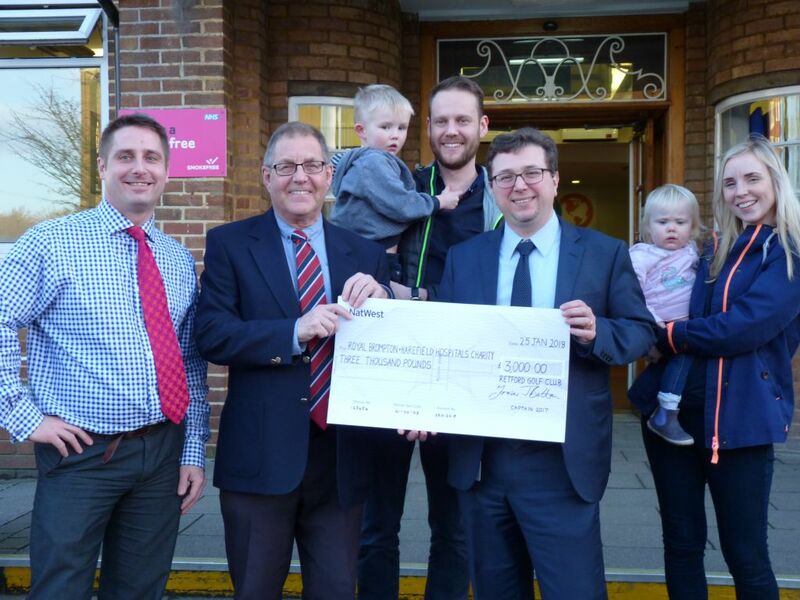 From the left: Ashley Westpfel, Director of Fundraising Brompton and Harefield Hopsital; Fraser Britton Retford GC Captain 2017; Andrew Britton and Frank: Fabio di Robertis, consultant heart surgeon; Lauren Britton and Nancy. Fraser Britton, Retford Golf Club’s Captain 2017 chose Harefield Hospital for his chosen charity. Fraser chose this charity for a very personal reason. On honeymoon in December 2012, his son Andrew, a former Ordsall Hall student, caught a virus which attacked his heart, causing 6 cardiac arrests. This happened in the Maldives and he was flown to Bangkok which had the nearest heart hospital capable of treating him. After six weeks he was well enough to be flown home and was admitted immediately to Harefield Hospital where doctors told him he would need a heart transplant. Ten months and a ventricular assist pump later, he had a transplant on his Mum’s birthday. Since then he has gone from strength to strength, back to work full time and the father of two children. Without the skill and dedication of the team at Harefield and the amazing courage and generosity of the donor’s family Andrew might not have survived. 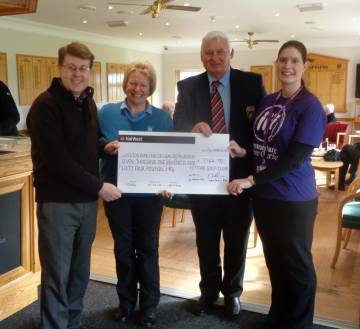 Retford Golf Club is proud to have raised money for such a good cause. On Friday 17th March 2017, Retford Golf Club presented a cheque for the value of £7,164.90 to be shared between Weston Park Cancer charity and the Aurora Wellbeing Centre. Bill Manning (Captain 2016) and Keran Hutchinson (Lady Captain 2016) are so grateful for the generosity of the members, the Professional staff, local clubs and businesses, and also gave particular thanks to the MWF Fiddle, organised by Terry Cullen and Mick Wilde. Weston Park Hospital in Sheffield is one of only four dedicated cancer hospitals in England. Weston Park Cancer Charity supports the hospital by funding pioneering cancer research and helping to improve cancer treatments and care for patients from this area.